That's right...rocky road. It's one of those "olde tyme" ice cream flavors. Whenever I think of rocky road, I think of this scene from The Goonies. For some reason, though, I misremember the guy's name as "Lugjug" and not "Sloth." Where'd that come from? These are super chocolatey and chewey--almost like fudge brownies. My secret is to use multiple sources of chocolate: ground-up Cocoa Pebbles, cocoa powder, microplaned milk chocolate, and microplaned unsweetened Baker's chocolate. Toasting the almonds brings out thier flavor and their crunch. And, of course, these wouldn't be rocky road cookies without the mini marshmallows. I freeze my marshmallows first so that they don't melt too fast in the oven. As with my s’more cookies, you need to keep an eye on these guys and be careful not to overbake them. The marshmallows could melt, and when the cookies cool, you could end up with really yummy-smelling hockey pucks. Bake at 350º for 10 minutes. (Be very careful not to overbake them.) 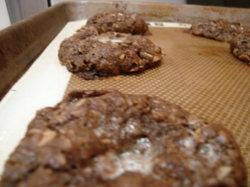 If the cookies feel too underdone when you remove them from the oven, let them set on the cookie sheets for two to three additional minutes. Then place cookies on wire racks to cool. These look fabulous!! Check the recipe - I think you left out a word. Under dry ing.,you have 1 1/2 cups ground . . . I'll try these for sure! Thanks, Lorraine. It was something weird with the line breaks in the table. Fixed now!